(Nanowerk News) The salinisation of rivers is a global problem that affects to countries all over the world and it causes a high environmental and economic cost, and poses a high risk to global health. Climate change and the increasing water consumption can worsen even more the future scene, according to an article published on the journal Environmental Pollution ("Salinisation of rivers: An urgent ecological issue") based on the research developed by an international team led by the experts of the Department of Ecology of the University of Barcelona Narcís Prat and Miguel Cañedo-Argüelles. The article is also signed by Ben J. Kefford from the University of Technology of Sydney (Australia); Christophe Piscart from the University of Lyon (France); Ralf B. Schäfer from the University Koblenz-Landau (Germany); and Claus-Jürgen Schulz from the Thuringian State Institute for Environment and Geology (TLUG, Germany). The effects of global change could increase even more the salinisation of rivers in many regions. River salinity can be natural, caused by the geology of the area or the climatology, or anthropogenic, in other words, caused by domestic and industrial waste discharges, mining activity, agricultural and farming residues, etc. In worldwide river ecosystems, excessive salt concentrations caused by human activity are a threat to the survival of organisms and communities, biodiversity, the ecosystem’s biological balance, and it produces severe economical and public health problems. According to Miguel Cañello-Argüelles, the main author of the article, “this article aims at giving a integrating view and emphasize the seriousness of the ecological, economic and global health effects that secondary salinisation has”. The expert remarks that it is a global process: “It happens in many regions from all over the world, although there is a great ignorance about the problem”. The most extreme case of salinisation occurs in some Australian rivers. “However —Cañedo-Argüelles adds—, in this case local studies have been done in order to clearly diagnose the problem; therefore, all the agents who make use of the natural resources of some rivers (farmers, industrialists, etc.) have collaborated in the process of finding solutions”. In Europe, the process of river salinisation by human action is getting worse as years goes by. “It is also a problem in Spain”, declares the professor Narcís Prat, director of the Research Group Freshwater Ecology and Management (FEM) of the UB. “ In the Ebro plain, due to soil’s characteristic and the kind of agricultural activity performed, rivers are saltier than in Australia —he explains—, but here river conservation is not among the priorities of water resources management”, so these problems are not solved. According to Prat, the question is even worse in the region of Murcia: “It is a semi-arid area where irrigation is a common activity and rivers are saline as a result of the excessive exploitation of water resources”. What is the degree of salinity of Catalan rivers? 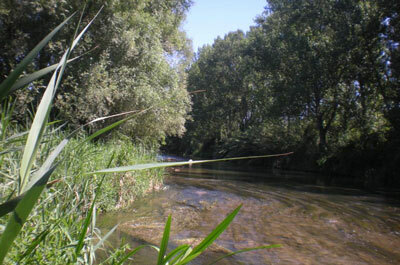 In the Catalan river system, there are also some parts where high levels of salinity can be found. To be exact, experts have studied the salinisation of the Llobregat River basin supported by Mesocosmos Sostaqua, an infrastructure located at the water-treatment plan of Balsareny. The pump, which reproduces the natural conditions of the river ecosystem, was built by the group FEM of the UB and the company Aigües de Barcelona. “We are aware of the salinity of Llobregat River —Narcís Prat affirms—, but apart from the salt, there are also other features that can damage the environmental quality of water. Therefore, sometimes we cannot determine what is more important: salt or the pollution produced by other factors. With Mesocosmos, we can study separately the effect of each factor (for example, the salt concentration) and differentiate its influence from the one made by the other factors”. Despite the qualitative improvement of Llobregat River water thanks to the collector of brines, which leads mining leachates directly to the sea, the UB experts alert that salinity is a remaining question because the collector has not been able to solve all the problems. According to Narcís Prat, “the level of salinity at the lower course of the Llobregat River where the area of potash mining begins is so high that its use can only be agricultural, not human. It is not such an alarming situation as in Australia but it is worrying. The situation is the same at the lower course of the Besòs River: its water is more and more salty, and in this case the reason is not mining but all the processes developed in order to decalcificate the water (like in dishwashers when we add salt to avoid the stains that lime will cause)”. Experts explain that excessive salt is also a factor that has a negative effect on water potabilization. For example, it makes necessary to install new technologies, such as reverse osmosis, that have put up the price of water potabilization for human consumption in the plants of Abrera and Sant Joan Despí. In addition, the use of chlorine to potabilizate water produces many chemical compounds (borates, chlorates, trihalomethanes, etc.) which can be toxic for environment and health. According to the article, current legislation is generally flexible when it comes to establish limits for salt concentrations in rivers. In Europe, salinisation is not considered an important problem and no legally prescribed environmental quality standards exist for salt. In many countries, business and industrial factor predominates over the necessity to set a limiting regulation. Miguel Cañedo-Argüelles considers that “legislation is still waiting. People are not aware of the severity of the problem and information about the effects of excessive salt on river ecosystems is missing”. In the article, the authors also quote some successful management strategies, for example, the Hunter River salinity trading scheme upstream in Singleton (Australia), with controlled salt discharges adapted to the volume of the river: when the volume is high, more salt is discharged, whereas when it goes down the quantity of salt is reduced. The study states that the effects of global change could increase even more the salinisation of rivers in many regions. Miguel Cañedo-Argüelles thinks that “it is difficult to predict the impact of climate change. In comparison with other regions of the planet, lower rainfall, worse drought, more water consumption, and therefore, more salinity in rivers are expected in the Mediterranean region”. Finally, Narcís Prat concludes that “the most important aspect is to stop fighting and began to work together. It is necessary to react against the problem of excessive salinity in Catalan and worldwide rivers before it will be a severer problem”.